The Gypsy Gentleman – Episode 05: London from Marcus Kuhn on Vimeo. I force myself to watch Ink Master. Honestly, it’s mostly just to be able to make Dave Navarro jokes. (I call him ladyface. Not going to lie. Totally do) Occasionally they have a good guest judge (Mr. Stell!) that makes me not hate it, but for the most part I watch it because I can’t not. The entire time I’m watching scratchers get reputations, I’m usually thinking “god, there needs to be a new episode of The Gypsy Gentleman airing soon’. This time Marcus sets his sights on London, during the Jubilee. The formula got GG is a little different than most of the Tattoo media out there- Marcus picks a city and two artists and spends the episode aquatinting us with it all. It’s more of a travelogue than a documentary- but it works. So well. The London episode features Valerie Vargas (who’s also the subject of a three episode Tattoo Age Arc this year) and Ian Flower. I really hope that Marcus keeps these up- I for one would love to snag a DVD set of all of the Gypsy Gentleman’s adventures! I’ve been sitting on this news for ages now with a sworn promise to Mr. Grosso that I wouldn’t spill the beans. But the cat is out of the bag now…. and it’s time to be excited. I first heard about DeVita getting interviewed for Tattoo Age last year from Scott Harrison; he gave me the full rundown of how the filming went and I got very excited about seeing the finished product. DeVita is so iconic- while I still contend that the Fred Corbin arc from Season 1 of Tattoo Age may be THE single most impressive tattooer documentary I’ve ever seen… I’ll admit that the idea of a Thom DeVita segment literally gives me goosebumps. The season will also include Valerie Vargas, who’s artwork I’ve been impressed with since before she was tattooing, and Mutsuo of Three Tides tattoo. 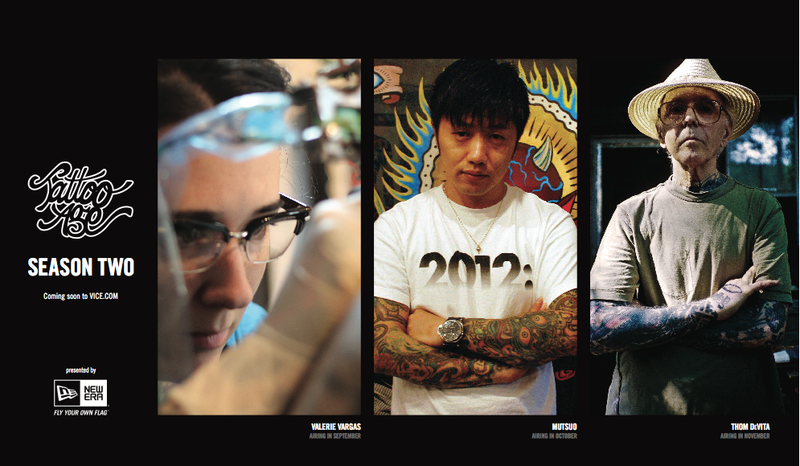 After a very impressive (and more content loaded) season 1… Will Tattoo Age still be able to impress? I guess we’ll have to wait, watch and see for ourselves! The trailer for Season 2 will hit Vice.com on September 5th. Tattoo Age has announced one of the artists who’ll be featured in ‘season 2’: Frith Street’s Valerie Vargas. Valerie is a world class tattooer and I’m very happy that she was chosen. I believe the episodes start airing this fall; I’ll update when I have more information. I’m sworn to secrecy on the other artists who’ll be rounded up for season two, but I can say this: You’re going to be happy. Very happy. I like to think that if I interviewed Miss Vargas, it would have gone exactly like this; save that I probably would have asked her to recite a bunch of a lines from Trainspotting. Luckily Scott Sylvia is much less childish than I am. Valerie is an amazing tattooer. Check it out! Last Sparrow Tattoo is a community forum for tattooers and folks who get tattooed and can be found here: LST. To celebrate Mother’s Day (which is celebrated April 1st in the UK and May 8th in the US) Valerie Vargas and Steward Robson of Frith Street Tattoo have each painted one of a kind flash sheets with a MOM theme to be auctioned off with 100% of the proceeds going to charity. Winning bid gets the original artwork, which will not be reprinted. In addition, Valerie will be tattooing Mother’s Day designs at Frith Street on April 1st- contact the shop for more info! Both Valerie and Stewart do phenomenal work; I’ve been mulling over a Mom tattoo since my Mother passed away last July- maybe this will motivate me to go get something done; shame Valerie and Stewart are so dang far away!